From the most experienced anglers to the first timers, Capt Jeff will do everything in his power to make sure you have a great time fishing! Over the years Capt. Jeff has guided many anglers to their very first fish, and others to their biggest. He will give you as much or as little help as you want. 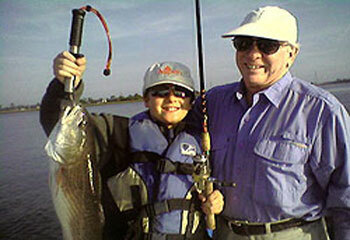 He's great with kids and will do everything from bait the hooks to casting the line if needed. Capt. Jeff can customize your charter to the type of fish or location desired, provided allowable weather conditions and time of year. Float Fishing - Drifting live shrimp on slipfloat rigs. We drift these with the current to go over areas such as shell banks or sandbars were speckled seatrout and other species lay in wait. Jig & Shrimp - A live shrimp pinned to a 1/4 jighead. 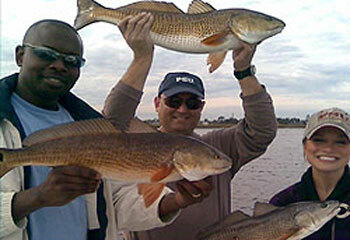 We work areas up in the creeks and along the intracoastal using the trolling motor or anchored up. We cast to points & pockets along the way as well as near shell banks and deep holes.